Common depictions of the Christian doctrine of hell, perhaps borrowing images from classic literature and Dante, portray it as a place of literal fire, where tortured souls repose in anguish, a vision much used by itinerant evangelists and manipulative preachers. A further degradation of this cartoon vision finds human souls not only suffering extreme torture, but prodded by red devils with tiny horns, cloven hoofs for feet, spiraling tails, and pitchforks at hand, a caricature used to both trivialize the concept as well as mock the very idea of hell. In the Revelation of John, we discover a lake of fire, prepared for the devil and his angels, as an abode of punishment, as well as a bottomless abyss. Jesus himself, of course, named hell as the place where the worm doesn't die and the fire is never quenched, but he spoke of eternal darkness as well, eternal destruction and eternal death. Such descriptions are at best figurative, much like other parts of the Bible where, for instance, God is described as a hen brooding over her chicks (God isn't literally a fowl.) 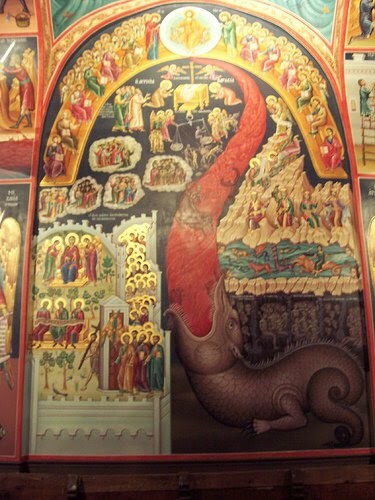 Rather, it seems apparent that according to the teachings of the ancient Church, the non-literal descriptions of hell that appear in Scripture and elsewhere pertain to fundamental qualities of a disposition of being, not one defined primarily as punishment, but of death. Strains of western Catholicism and Protestantism have fundamentally defined death as legal punishment, an expression of God's wrath. Death is entrenched within a judicial context; it is a sentence for sin. God is angry, according to the western view, and Christ's merit applied to us satisfies his anger, so He dies as a sacrifice to appease the Father. A gross oversimplification and popular notion of the historical understanding of death in the West paints an ugly and frightening picture for those who take it seriously. Good people or redeemed people who have faith in Jesus, whom the Father punishes in our place through an expression of divine anger, overcome the punishment of death and go to heaven; unrepentant sinners suffer their just punishment and are cast howling into hell for their evil deeds. Death is the judicial sentence of all humanity; some overcome it totally through an abstract and forensic transaction, others do not. The Greek fathers and the eastern churches historically do not share the western legal emphasis, nor the consequent view of atonement. The fathers of the church teach that humanity is the author of death, not God. St. Basil in the fourth century writes, "God did not create death, but we brought it upon ourselves." Death is the result of sin; it is the final product that we, apart from God, create for ourselves through the power of the human will, that also ensnares and condemns us. "When we see the world as an end in itself, everything in itself becomes a value and consequently loses all value, because only in God is found the meaning (value) of everything, and the world is meaningful only when it is the "sacrament" of God's presence. Things treated merely as things in themselves destroy themselves because only in God have they any life. The world of nature, cut off from the source of life, is a dying world. For one who thinks food in itself is the source of life, eating is communion with the dying world, it is communion with death. Food itself is dead, it is life that has died and it must be kept in refrigerators like a corpse." It is possible to envision death, defined in this way, as at least tolerable, but if we posit the reality of redemption, that is, from a certain perspective, the added imposition of the presence of infinite and divine personality figuratively signified by fire, death then takes on a further dimension. Death doesn't dissolve away into nothingness, but energized by the presence of creative, personal and divine love, it becomes a separation fixed in an eternal position. Death is transmuted into bitter torment and despair. Hell in this view is understood as the presence of God experienced by a person who, through the use of free will, rejects divine love. He is tortured by the love of God, tormented by being in the eternal presence of God without being in communion with God. God's love is the fire that is never quenched, and the disposition and suffering of the soul in the presence of God who rejects him is the worm that does not die. Whether one experiences the presence of love as heaven or hell is entirely dependent on how he has resolved his own soul to be disposed towards God, whether communion or separation, love or hatred, acceptance or rejection. Hell, then, is not primarily a place where God sends people in his wrath, or where God displays anger, but rather, it is the love of God, experienced by one who is not in communion with him. The figurative, spiritual fire of God's love is transcendent joy to the person purified and transfigured by it through communion in the body of Christ, but bottomless despair and suffering to the person who rejects it, and chooses to remain in communion with death.